Plastics manufacturers use organic peroxides as initiators in the polymerization of plastic. But, these chemicals are thermally unstable. They can ignite or explode if not kept within their safe temperature range. What if a plastics manufacturer ignored the risks associated with using organic peroxides? They may encounter no consequences for an extended period of time as by chance the chemicals remain in a stable condition. But, there will come an occasion where the conditions reach critical levels. Someone may leave the chemical in a different location, or the outside temperature is higher than normal. Suddenly a major explosion and fire rocks the manufacturing facility. In a worst-case scenario, the incident could affect surrounding houses and businesses. Avoid evacuations, injuries and negative publicity by using climate controlled chemical storage buildings. Some temperatures are too low to store chemicals. Chemicals solidify when the temperature drops below their freezing point. This creates a risk that containers will burst, leading to a spill. Even if the temperature doesn’t drop below the freezing point, cold temperatures change a chemical’s properties. The viscosity deteriorates. Extreme cold damages the emulsions in paints. The consistency becomes gritty or clumpy, making it unusable. High temperatures also negatively affect chemicals. Vapors form inside their storage containers. The increase in pressure from these vapors can cause the container to burst and potentially spill. For example, the bleaching agent, hydrogen peroxide is unstable and decomposes when heated. It releases oxygen, which auto-ignites when mixed with organic compounds. Volatile chemicals are not always stored in large enough quantities to require a mass evacuation. But, the risks of storing any chemical outside its safe temperature range are still significant. Avoid spills, explosions and injuries by using temperature controlled chemical storage buildings. U.S. Chemical Storage supplies climate controlled chemical storage buildings. These buildings are explosion proof or non-explosion proof. The choice depends on the specific chemical in store. Key features of our climate-controlled storage buildings include the single point temperature controllers. We offer a simple thermostat, or a more robust PLC. The simple thermostat will control the heating and cooling units within a range set by the user. The PLC provides the ability to control the temperature range, as well as high/low temperature alarms and recording capabilities. An air-conditioned chemical storage building, keeps temperatures constant in the range 60 F (15.6 C) to 80 F (26.7 C). This range is ideal to prevent the deterioration of chemical properties. 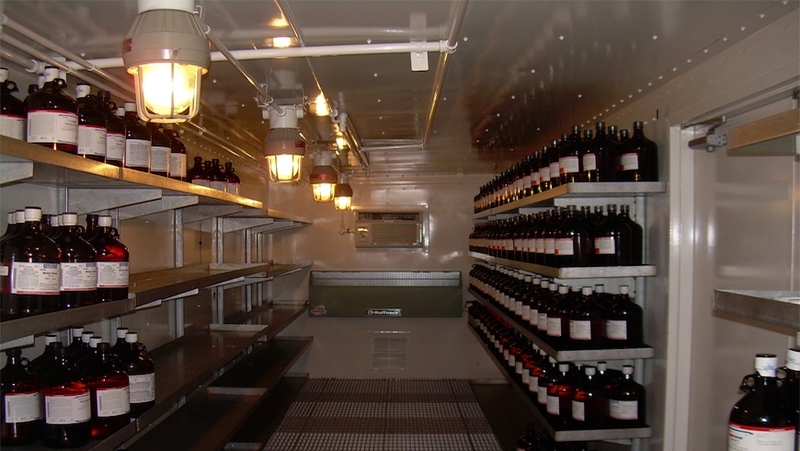 A temperature controlled building prolongs the shelf-life of chemicals in storage. Refrigerated chemical storage buildings keep temperatures constant in the 40 F (4.4 C) to 65 F (18.3 C) range. Freezer units can even control storage temperatures down to 20 below zero (-28.9 C). Chemical storage buildings with explosion proof refrigeration systems can utilize wall mounted and split refrigeration units. Any explosion proof system is available in NEC Class 1, Division 1 or Class 1, Division 2 classifications. Heated chemical storage buildings keep storage temperatures constant at a level above 55 F (12.8 C). Explosion proof convection or fan forced heaters are available. Low profile designs and wall or ceiling mount options enable designers to reduce the impact of these units on storage space. Want to Know More about Climate Control Storage? Contact U.S. Chemical Storage to learn more about climate controlled chemical storage buildings. Find out more about our product offerings here. Our professional consultants are waiting for your call to help you match the best solution to your application.